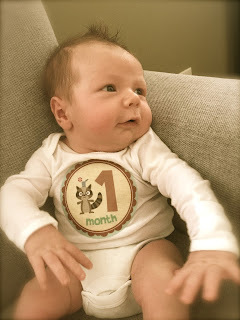 Roots & Little Wings: Finn is 1 month old! 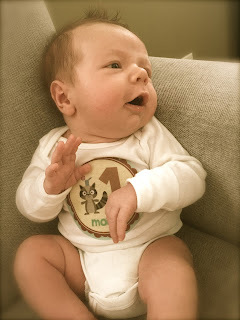 Finn is 1 month old! 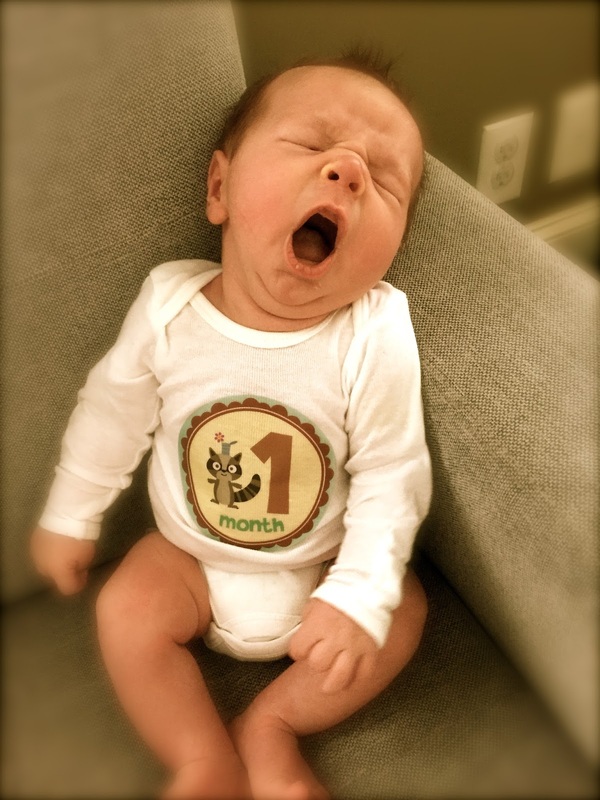 I can't believe this sweet baby is already 1 month old. Time sure does fly by when you are loving on two sweet boys! Finn is a very sweet baby who is already very attached to his momma (just like his big brother was as a newborn). He LOVES to sleep on or with me, and prefers that I never put him down. Baby wearing has def. become the new norm in our house, and I see a lot of chiropractor visits in my future. ;) Finn is eating like a champ and getting bigger by day. At his 2 week appointment, he was already 10 lbs 8 oz (95%), 21.5 inches long (90%) and his head was 15 1/4 in (98%). He doesn't have another appointment til 2 months, so I will have more stats at his next monthly update. Sleep: Finn is still a very sleepy baby overall. The longest he is up during the day is usually 1 hour before he becomes overtired, so I try to make sure he is back asleep before the 1 hour mark hits. He will go right to sleep on me or with me after I nurse him, but he is starting to wake up shortly after I lay him down which is quite a "dance" especially at bedtime. We are thinking maybe he is starting to be ready for an earlier bedtime since he is becoming quite fussy in the evenings. We learned this the hard way with Noah when he was a newborn. We kept him up til 9 or 10pm trying to soothe him all sorts of ways and ended up overstimulating him and had a very fussy baby on our hands. The problem was fixed as soon as we put him to bed earlier at night, so we are going to go ahead and give this a try with Finn at a much earlier age. I will keep you posted on how it goes at his next update! Finn is a pretty good sleeper at night so far, and he sleeps anywhere from 3-5.5 hour stretches. He is very cuddly and likes to make all sorts of sounds and grunts in his sleep. Eating: Loves to eat and he nurses all the time! 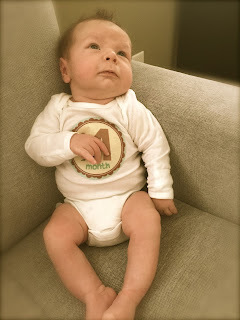 Happy 1 month Finn! Til next month!